Hi! Hope you are doing great! I'm knee deep in getting my house ready to sell. Phew that's a lot of work isn't it? Especially when you have lived in it like you'd never ever leave. Cannot believe how much stuff we have accumulated! Anyway, I won't bore you with that...just be on the lookout for an epic grab-bag sale and a few giveaways to help clear out my 2,000+ collection. That's right...I finally counted all my polishes for the first time ever. Have you counted yours? KBShimmer Let's Not Coral - a pink leaning coral that sometimes seems more pink, sometimes more orange. I'm not a big coral person, but this one won me over instantly. Flawless formula and opaque and shiny in 2 coats. 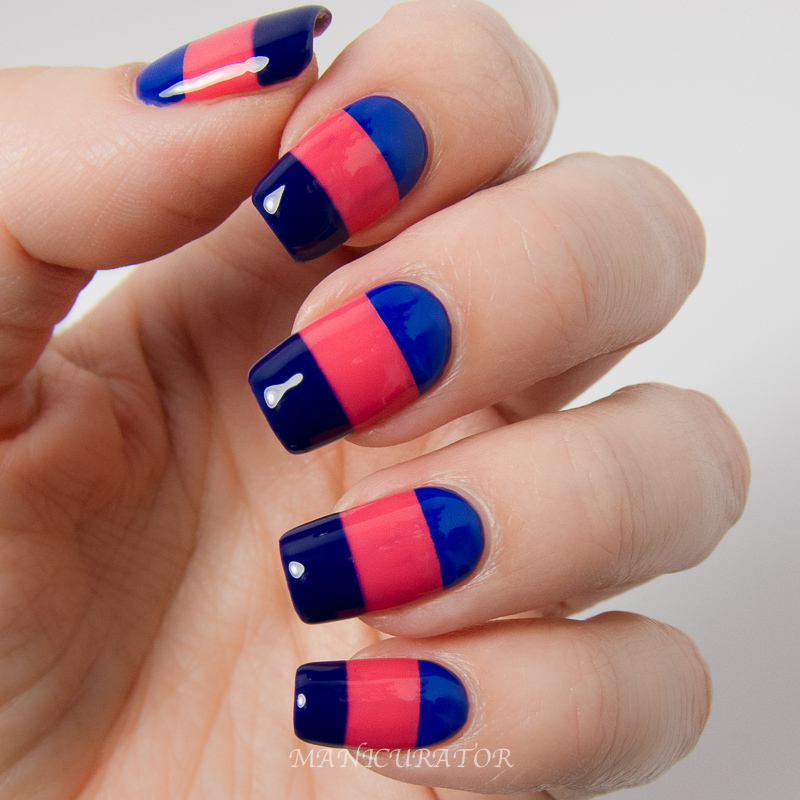 Super easy, but striking mani. I simply taped off the middle and applied two coats of Low & Be Bold and Right As Reign (also perfect formulas!). I put Right As Reign on the tips and it shows as a deep purple navy. I put Low & Be Bold next to the cuticles and it's a bright cobalt blue, with a slight jelly finish (again, perfect formula!) 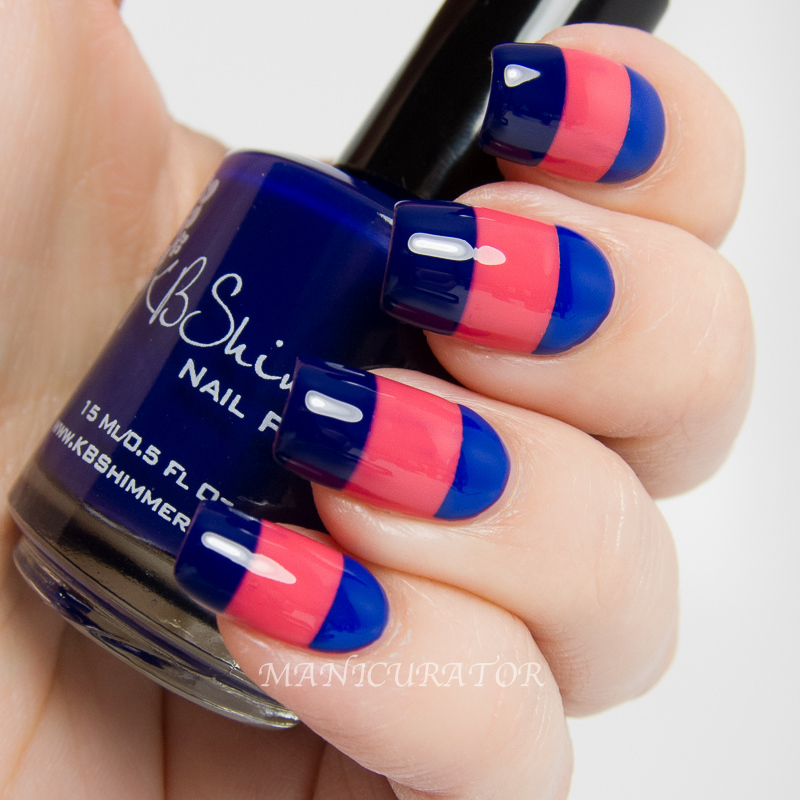 Love the contrast with these shades and the mani was just full of saturated color. This looks great and its so easy to achieve too. Great colors. Just when I thought I couldn't love KBShimmer any more she came out with cremes. That coral is to die for! These colors are so vibrant! This is absolutely gorgeous! I love the colors ! They remind me of Nautical Nails ! Also, im new to doing nail art & recently I have recreated your textured pinwheel nail art if you'd like to check it out & let me know what you think @ www.lacquerbaby.blogspot.ca ! So very pretty and flawless...as usual :) I'm always amazed at the shine on your manis. What top coat did you use for this, please? Thank you! Hi Delhi, Thank you!! 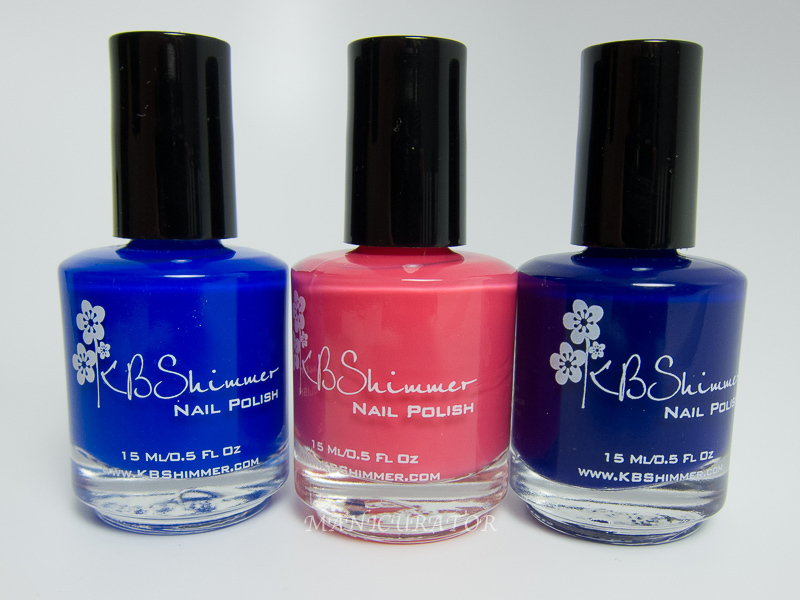 :) I used KBShimmer Clearly On Top for these, I also use Seche Vite regularly. Now I want to get these shades just so I can recreate this beautiful look ;-).